This post is for the Mac users out their looking for a high quality USB conference phone that is wireless. Just to make everyone feel good about our Mac compatibility Andrew Chatfield our lead support technician has made a few videos outlining the integration. 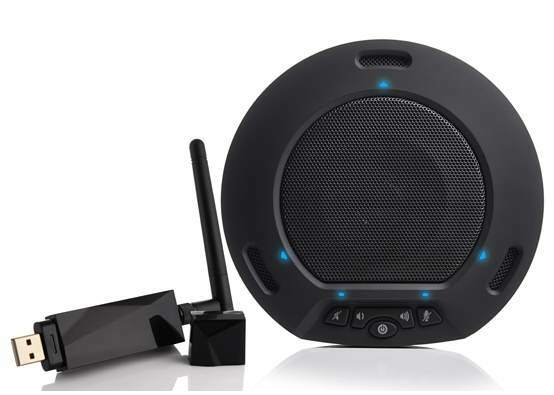 The HuddlePod Air is a wireless speakerphone that comes with a USB 2.0 receiver. Setting up a conference room for online meetings has never been this easy. Simply plug in the USB 2.0 receiver to your Mac or PC and the HuddlePod Air can sit on your table up to 30 feet away with no messy cables in between. The audio quality of the HuddlePod Air is far superior to its Bluetooth counterparts and when you include the 256 channels of echo cancellation, noise suppression and the full duplex audio the HuddlePod Air really stands above its “competition”. Don’t worry about the headaches of pairing and re-pairing Bluetooth devices. The HuddlePod Air provides a reliable wireless connection directly to your Mac or PC for online meetings with your favorite video conferencing software such as GoToMeeting, WebEX, Skype for Business and Zoom.US. The HuddlePod Air is a perfect addition to any conference room and you can easily pick one up from a preferred distributor or your favorite online retail store such as Amazon, B&H Photo or Conference Room Systems.com. Wireless audio conferencing has never sounded this good. Take your web video conferencing to the next level with the HuddlePod Air.